Disconnect home downspouts from sewers and manage rain water with "green infrastructure". Pick up pet poop and dispose of it properly to keep it out of our shared water resources. Avoid fertilizer and pesticides on lawns and gardens. Reduce use of salt in winter. Shovel snow frequently and use less or no salt. Adopt-a-Storm-Drain near my home. Avoid dumping anything down a storm drain that I would not drink or swim in. Take old paints, pesticides or waste chemicals to a hazardous waste collections site. Rain and melting snow travels across streets and lawns into our storm drains and rivers and into Lake Michigan. It carries litter, fertilizer and dog poop into water that we eventually drink. This “run-off” does not go through a sewage treatment plant. It becomes water pollution. 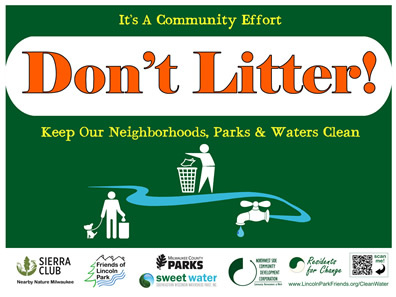 The water we drink is from Lake Michigan so it’s important to keep our neighborhoods, parks and rivers clean! Want your own Anti-Litter Yard Sign?